Hitsugaya Toushiro, this sword represents Toushir, another one of our finest anime collectable Zanpakuto. This is the Hyoruinmaru also know as Ice Ring. When sealed, Hyourinmaru looks almost exactly like a normal zanpakut with the exception of the guard, which is in the shape of a four-pointed star, made out of metal. The hilt is also light-blue, which matches Hyourinmaru's abilities. Hyourinmaru's initial release command is "set upon the frozen heavens". Hyourinmaru itself remains the same, but gains a crescent-shaped 440 stainless steel blade. 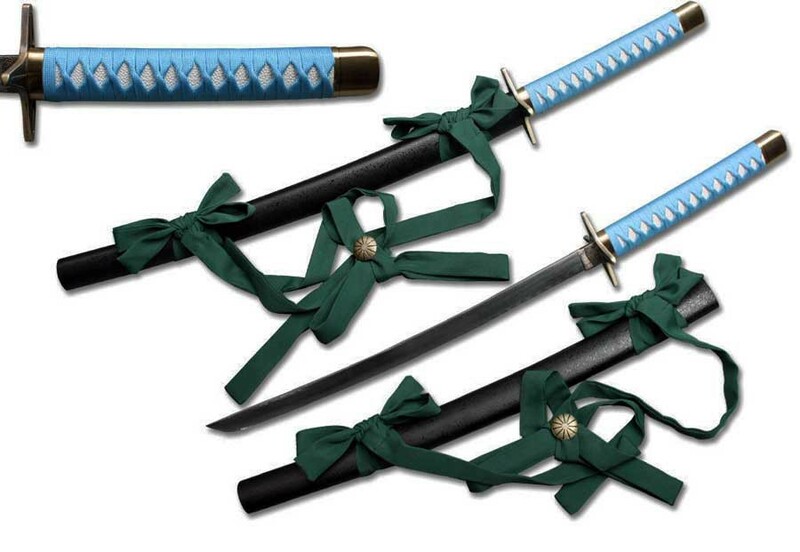 The scabbard is wrapped with green cloth as shown in the Anime Series, which can be hung on your shoulder. The guard is made to shape like the one he has in Japanese Manga, The Star Guard. Handle is wrap in light blue nylon cord. Scabbard is pained in black with dotted desing on it. Hyourinmaru allows Hitsugaya to control the weather, specifically water and ice. His slashes create an immense amount of spirit power which overflows from the tip of the blade, creating a flow of ice shaped like a Chinese dragon. The dragon flies at opponents and instantly freezes anything it touches. The chain-blade also becomes encased in ice and freezes anything Hitsugaya traps with it. Hyourinmaru is considered the strongest of all ice element zanpakuto in Soul Society.